All of our Fun Time Trolley buses are lift equipped for wheelchairs and or other mobility aids and may be accessed at any designated Fun Time Trolley stop. For any passenger who is unable to get to a trolley stop then a Para-transit van may be scheduled for a next day pick-up. Para-transit van reservations may be made by calling (865) 453-6444. Our Para-transit van service is an origin to destination service for the mobility impaired resident or visitor staying anywhere within the city limits of Pigeon Forge or anywhere within ¾ of a mile of any Fun Time Trolley route, which ever applies. 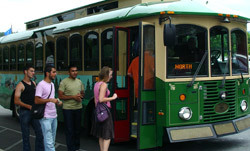 Permanent residents planning on using the Para-Transit van service must submit an “ADA Para-Transit eligibility application” to the Fun Time Trolley Office, 186 Old Mill Avenue, Pigeon Forge, TN 37863. These application forms are available at the same location. The certification process shall be waived for visitors staying no more than 21 consecutive days. Drivers are permitted to assist the wheelchair passenger on and off the lifts as needed. All wheelchairs and mobility aids are required to be strapped down (secured) while in Fun Time Trolleys or Para-Transit vans. Information on the Fun Time Trolley routes will be provided in large print upon request to the Fun Time Trolley office. Hearing-impaired callers may contact the Fun Time Trolley though the Tennessee Relay Center, by calling 800-848-0298. Information is available in alternative formats upon request. Interpreting services are available through Fun Time Trolley office staff - phone 865-453-6444. Hearing impaired callers may contact Fun Time Trolley through the Tennessee Relay Center, by calling 800-848-0298. Translation of our services is available in multiple languages on our website www.pigeonforgetrolley.org. Our goal is to reduce language barriers of persons with limited English Proficiency (LEP). Fun Time Trolley operates without regard to race, color, or national origin. City of Pigeon Forge Fun Time Trolley is committed to providing equal access and opportunity to qualified individuals with disabilities in all programs, services, and activities. In some cases, individuals with disabilities may need reasonable modifications to policies and procedures to ensure access to transit services. City of Pigeon Forge Fun Time Trolley will take appropriate steps to ensure that persons with disabilities have an equal opportunity to participate. Please contact Eric Brackins, Assistant City Manager above to discuss your requirements. Any person who believes he or she has been discriminated against under the Americans with Disabilities Act (ADA) including but not limited to obtaining a reasonable modification may file a complaint by contacting Eric Brackins, Assistant City Manager whose contact information is listed above. Click here for ADA Complaint Form.